In Autumn Concert Overture, Op. 11. Royal Scottish National Orchestra/Bjarte Engeset. recorded in Henry Wood Hall, Glasgow, 13�15 May 2003. Here we have a slap up-to-date product, as technically advanced as is currently possible, and at a bargain price. Whilst the majors are charging �15 - �16 for a SACD compact disc, Naxos is supplying these at half this price. There also does not seem to be any limitation on quality (of sound or of performance). 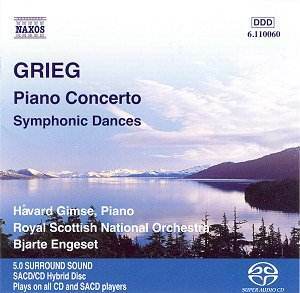 The disc under review is the new recording of Grieg�s ever-popular Piano Concerto, coupled this time with more orchestral Grieg, which makes quite a pleasant concert. This is better than the usual coupling which is the Schumann Piano Concerto. The recording quality on the present disc is superb, being clear, undistorted, in a believable acoustic, but so are many of Naxos�s current offerings in the normal format. Still, making these new formats available at little less than mid-price might sway the record buyer in favour of these formats. The disc opens with an excellent performance of the Concert Overture "In Autumn" with the Scottish musicians playing for all they are worth and sounding as though they have the Northern idiom under their belts. They are then joined by Havard Gimse at the piano. He gives a very straightforward performance of the concerto, not messing it up with mushy sentiment or flashy brilliance as so many other soloists manage. I find this approach very satisfying, and to hear it treated as a serious piece of music is very satisfying. The sleeve notes describe Havard Gimse as one of Scandinavia�s leading international pianists, and he wears this epithet with aplomb. His career has been primarily in Scandinavia, but recently has expanded into the international field. With performances like this his future is sure. The orchestra completes the programme with a lovely performance of Grieg�s Symphonic Dances. The four movements are in quite a different vein than other sets of Symphonic Dances such as those by Bernstein, Hindemith and Rachmaninov. These are pure Grieg and the Northern atmosphere comes to the fore in this superb performance. I had never expected the Royal Scottish National orchestra to absorb the atmosphere so well, but I remember their discs in Naxos�s American Music Series where they similarly absorbed the idiom. This ability is in part down to the qualities of the conductor, and Bjarte Engeset certainly seems to be able to make his Scottish band play this music for all it is worth. When there are many bland offerings around these days, it pleases me to be able to welcome this disc with all enthusiasm.